TJ Formal Dress Blog: Ask TJFormal: How are dresses packaged for shipping? Ask TJFormal: How are dresses packaged for shipping? Q: How are dresses packaged for shipping? We ship out dresses the same way they come into us from the manufacturer - in the smallest package possible. This keeps our shipping costs down, which in turn, keeps your costs down by enabling us to offer free shipping. Because dresses are compacted as much as possible, they will arrive wrinkled. Just plan to take some time to get those wrinkles out before your event. There are a few ways to help relieve those wrinkles and get you into that dress. You can steam it yourself with a handheld steamer or have it professionally steamed. Or just putting it in the bathroom while taking a hot shower helps get them out. You can also buy a bottle of spray wrinkle release - this works great and won't damage the fabric. You might even find it at a dollar store! Want to know how to care for your specific fabric? 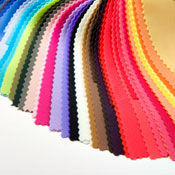 Check out our Fashion Glossary on Fabrics! Your site has SO much information! I love it!